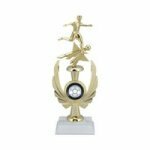 The sweeping Phoenix wings perfectly frame the the raised black and silver baseball in the middle of this award. The batter shown finishing his home run swing on a dynamic star. 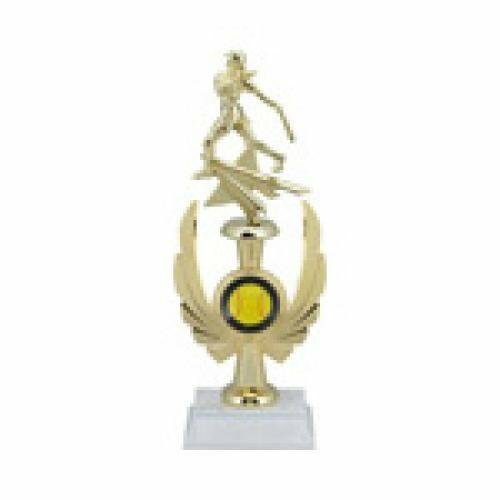 This award stands a full 13 1/4" tall. The while marble color finished base allows plenty of room for all of your personalization needs. This will sure to be a hit at your next awards ceremony. The sweeping Phoenix wings perfectly frame the raised silver and black basketball insert in the middle of this trophy. The basketball player is shown making an easy layup on a dynamic star. This award is 13 1/4" high. The while marble color finished base allows plenty of room for all of your personalization needs. 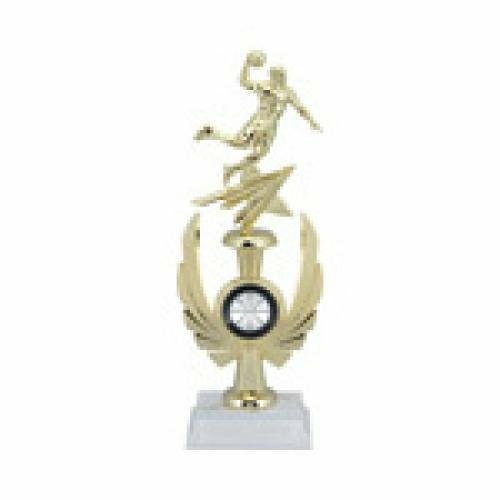 This will sure to be a slam dunk at your next awards ceremony. 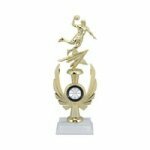 Phoenix Basketball Female 13 14"
The sweeping Phoenix wings perfectly frame the raised silver and black basketball insert in the middle of this trophy. The basketball player is shown making soaring slam dunk on a dynamic star. 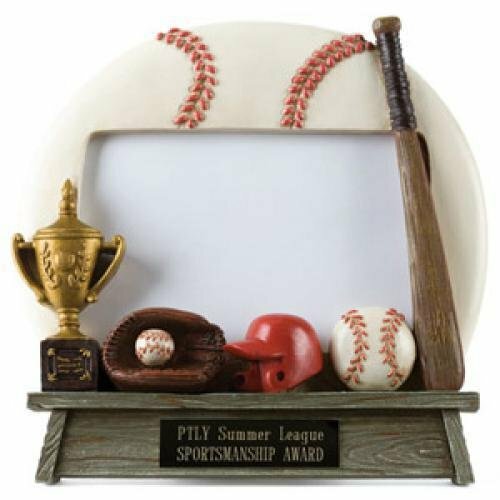 This award is 13 1/4" high. The while marble color finished base allows plenty of room for all of your personalization needs. This will sure to be a slam dunk at your next awards ceremony. Phoenix Basketball Male 13 14"
The sweeping Phoenix wings perfectly frame the raised silver and black megaphone and pom pom insert in the middle of this trophy. The cheerleader shown with her leg high in the air helping to get the home team crowd to get into the spirit. 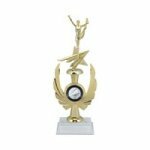 This awards stands 13 1/4" tall. The while marble color finished base allows plenty of room for all of your personalization needs. This will sure to be a winner at your next awards ceremony. The sweeping Phoenix wings perfectly frame the raised silver and black football insert in the middle of this trophy. The football player is shown with the ball safely tucked under his arm and running to make the winning touchdown. 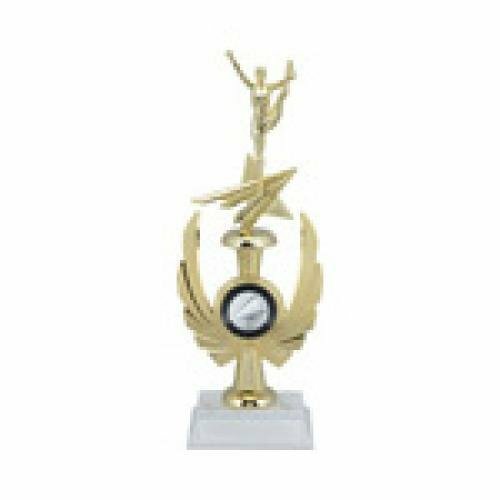 This awards stands 13 1/4" tall. The while marble color finished base allows plenty of room for all of your personalization needs. This will sure to be a winner at your next awards ceremony. The sweeping Phoenix wings perfectly frame the raised silver and black multi paneled soccer ball insert in the middle of this trophy. The female soccer player is shown with her leg back ready to make the winning goal on top of a dynamic star. This award stands 13 1/4" tall. The while marble color finished base allows plenty of room for all of your personalization needs. This will sure to be a winner at your next awards ceremony. 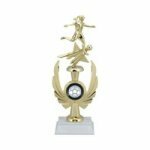 Phoenix Soccer Female 13 14"